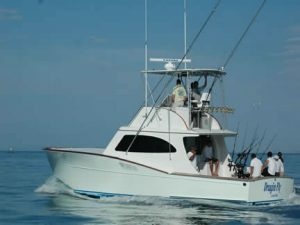 This 42-foot cold-molded Fly Bridge Sportfishing Yacht powered by twin 450HP Caterpillar 3126B electronic engines out of Los Sueños Marina in Playa Herradura has Captain James Smith at the helm, assisted by first mate Alberto and second mate Chela. Launched in January 2008 and cruising at 25 knots, it has full electronics, all new Shimano rods and reels, heavy and light tackle, stand-up and fly rods, tuna tubes, a large cockpit, fighting chair, fully air-conditioned salon, cabin, galley and head, plus state-of-the-art safety equipment. She is available for overnighters.